The John Felice Rome Center is full of excitement and opportunities, and I have experienced many new people, places and things since I arrived just one week ago. The open culture provides a solid foundation of meeting new people who want to experience the world with you. As I begin to say “farewell” to friends before I head to the John Felice Rome Center, I was asked about why I decided to study abroad as well as any apprehensions I may have. I thought I would share my answer with all of you. 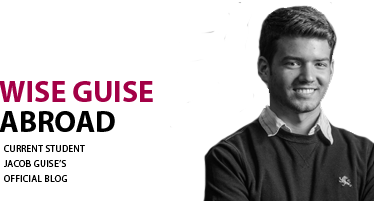 Jacob Guise is a junior finance major in the Quinlan School of Business at Loyola University Chicago. He is studying abroad in Rome during the fall semester. As a Quinlan Ambassador abroad, he hopes to show his road of self-development through sharing his journeys and experiences to others.